In the far western corner of Denali National Park and Preserve towers a peak of unrivaled beauty, Mount Russell. Unknown by the majority of Alaskans, only those who search out such beauty know of its presence. 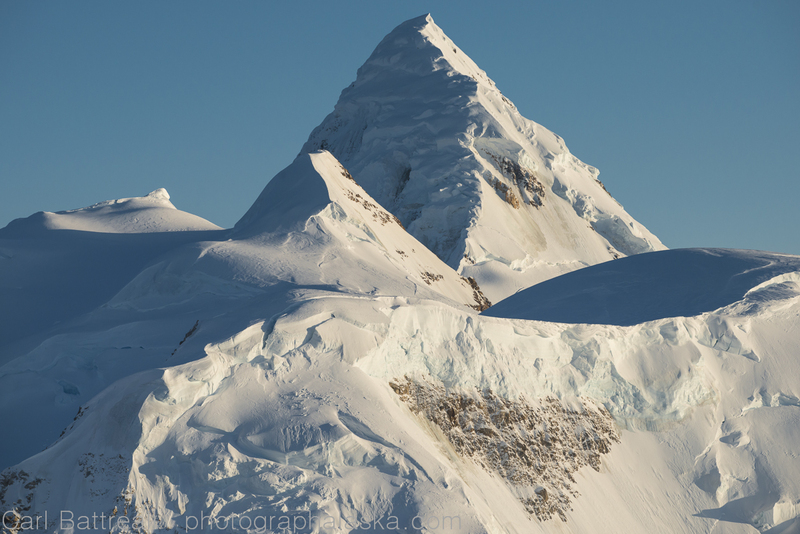 Mount Russell is a classic, pyramid shaped peak, with crumbling black rock and dripping, fractured glaciers that defy gravity. At 11,670 feet in height, Mount Russell isn’t super tall, but it remoteness and miserable weather make it a challenge to climb. The first ascent was in 1962 via the south ridge and ten years later, in 1972, the north ridge was climbed. The north ridge is now considered the “standard” route. 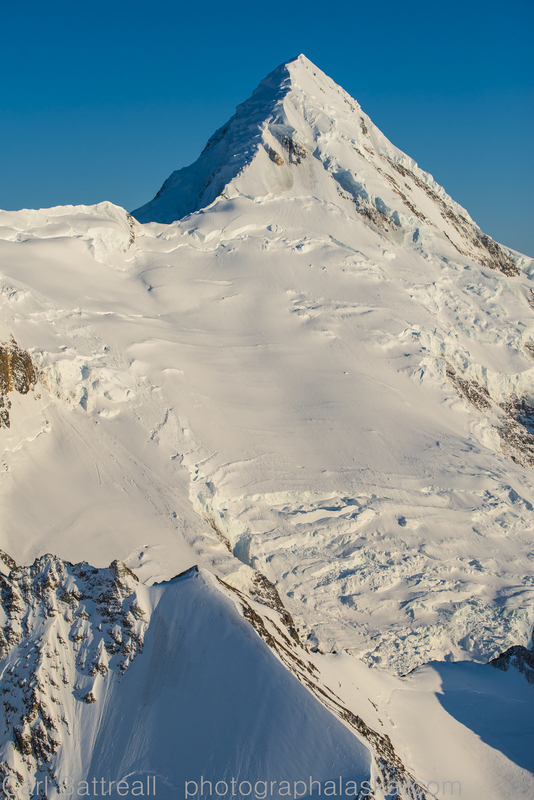 Both Alaska climbing guides feature Mount Russell and its north ridge route and yet, the mountain sees maybe one ascent every couple of years. The loose, steep and terrible looking east face was climbed once and for those looking for a true adventure, the awesome west face is still unclimbed. South Ridge and the wicked east face of Mount Russell. There are two ways to see Mount Russell from land. One is to land on the Yentna Glacier near the base of the North Ridge. The other is to land on the remote Purkey Pile strip and hike a few days to get a fantastic view. The sunlit west face of Mount Russell, the north ridge splits the light and dark. 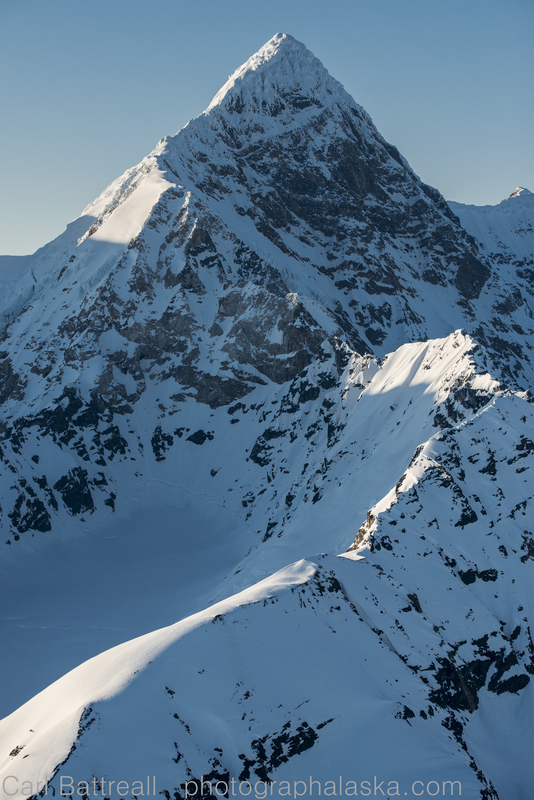 The west face still awaits an ascent and even a ski descent…hint hint. Personally, Mount Russell is one of those mountains that is best appreciated either by climbing it or by the air, where you can truly admire its shapely demeanor.